Are you ready to climb a mountain? To hike the trails and taste the hot chocolate near the top of the mountain? Then you should climb the Jenner, a famous mountain in the German Alps. Close to Berchtesgaden, Bavaria (southern Germany), the Jenner Mountain rises as one of the first of many German Alps. In the winter, it is covered with snow and is a great place for skiing. But in the summer, the mountain provides many hours of fun with hiking, plunging into the beautiful German countryside, and watching people leap off of cliffs to parasail. The summit of the Jenner is 1,874 meters, which is 6, 184 feet. The restaurant is 1,800 meters, which is 5, 906 feet and is the highest restaurant in Germany above sea level. Fantastic views await you at the summit of the mountain. 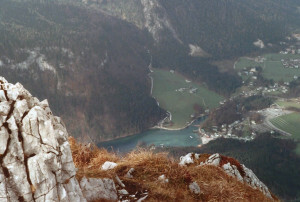 You can see the Königsee, a beautiful lake at the base of the mountain. Around you, other mountain peaks stretch into the sky. The spectacular alpine setting is breathtaking. Well-marked trails of varying difficulty will take lead you to heart-stopping panoramic views. The Bergstation, a restaurant stop near the top of the mountain, contains a terrace to enjoy the beauty, a meal, and a beverage of your choice, all at reasonable prices. 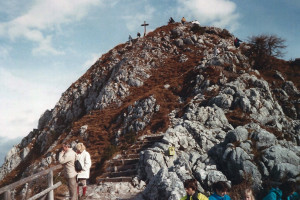 There is a Mittelstation, a stop halfway up the mountain that some hikers use when they wish to climb only the upper or lower part of the mountain. I would recommend hiking up the Jenner and riding down on the Bergbahn, a cable car that goes from the bottom to the top. My family and I have climbed this mountain several times, even when the boys were six and eight-years-old. They enjoyed running ahead, watching the brown and white cows graze in the fields, hear the clanking of the cow bells, and see the old cabin structures dotting the hills. Breathing in the clear mountain air, you will be enchanted by the colorful parasails, the tiny mountain flowers clinging to the hills, the evergreen trees, large pastures, and the birds soaring in the wind. If you would like to experience parasailing, there are tandem parasails located at the bottom of the mountain. You can experience golf, boating on the Königsee, or other leisurely activities, such as shopping and dining in the town at the base of the mountain. Another bucket list stop! Check it out at http://www.jennerbahn.de/de/englisch/.